Spring is in the air, and winter has officially left the building (but did it ever really arrive?). And WFN’s Top Catches is here to once again provide you with some wild and interesting tales! 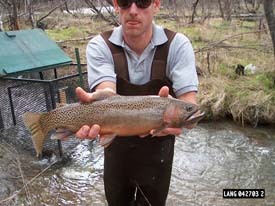 This is spawning westslope cutthroat trout captured in Langford Creek, North Fork Flathead River, Montana. Listen up! Scientists are constantly learning new things about fish, but this is a story that you’ll have to HEAR to believe. By studying the earbones of trout, a team of researchers have gained valuable insight into their lifetime movements. The data they have recorded thus far will allow biologists to “investigate non-native species invasions, identify important populations, and quantify life histories of freshwater fishes in river networks.” With all of the research being conducted, it really makes you wonder if these trouts’ ears are burning! It goes without saying that bear hunting is dangerous activity, even on the best day. But an Alaskan hunter recently found out the hard way that, in addition to being dangerous, it can also be very foolhardy. After fatally shooting a grizzly bear, Rod Moretz was approaching his kill when another grizzly came out of a nearby den and pounced on him. They rolled down a hill together, and luckily for Moretz, the fall disoriented the bear, which ran off. Moretz suffered nothing more than “minor scalp lacerations,” and after getting bandaged up by his 13-year-old son, he skinned his kill and went on his way. Talking about being able to grin and bear it! Ted Williams is one of the greatest baseball players who ever lived, but he was also an avid angler (he was even inducted into the IGFA Fishing Hall of Fame). Recently, an online auction posted a very unique item: a baseball bat/fishing rod hybrid that was custom made for Williams. The item ended up selling for $1600.00, and while its effectiveness is up for debate, there’s no doubt that this is one of the more unique rods that you’ll ever see. Sharks With Frickin’ Laser Beams! We all remember the scene in Austin Powers when the villain, Dr. Evil, laments over the fact that he is unable to acquire sharks that have laser beams attached to their heads. It’s a very silly scene in a very silly movie. But one marine biologist has done the unthinkable and attached a 50mW laser to the fin of a lemon shark. The reason? To test out a specific type of clamp, that supposedly causes no discomfort to the shark. Riiiiiiiiiiight.